Grade 1 Music Theory Revision Booklet covers the basics and provides plenty of practice. Published pre-2018 and before the ABRSM changes to syllabus (see details below). All In One Grade 1 Music Theory Revision Booklet supplements the many exercises already found in All-In-One to Grade 5 and All-In-One: Grades 1-3 book. Covers both Associated Board and Trinity College London topics. 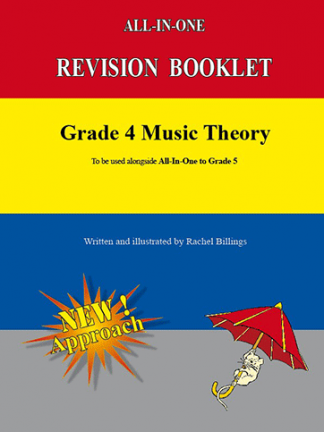 Grade 1 Music Theory Revision Booklet is useful for the few students who may wish a little extra practice material in the final stages before an exam (since there are already many exercises in the workbooks ‘All-In-One to Grade 5’, ‘All-In-One: Grades 1-3’ and ‘All-In-One: Grades 4-5’). This booklet will test your understanding of clefs (treble and bass), intervals, note and rest values, simple time, time signatures, sharps and flats, the major scale and its key signature, beaming tails, tied notes, and much more. The majority of the book is to be completed by both ABRSM and Trinity College London students whilst the short Appendix at the back contains topics which are beyond ABRSM Grade 1 requirements and for Trinity College London students only (although are beneficial for students using any music examination syllabus). Topics revised in the Appendix are Arpeggios, Ostinato and the Tonic Chord Symbol among others. BEWARE: There is no Answer book available for the Revision booklets (unlike the other books in the All-In-One series, where Answers are available). Rachel is considering writing them. Meanwhile, if you do not have a teacher to mark your work and need just a little help, please don’t hesitate to contact Rachel via the contact page.